Ethernet Module | Tibbo EM1202 w VenSYS.pl | VenBOX Sp. z o.o. EM1202 BASIC-programmable Ethernet module includes 100Base / T Ethernet port, 4 serial ports, built-in flash-memory, EEPROM, 32 I / O lines that can be used to connect external devices. Occupying a small area on a printed circuit board (19x17mm), the BASIC-programmable plug-in module inherits most of the features of the larger EM1000 module. The module includes a 100Base / T Ethernet port, 4 serial ports, built-in flash memory, EEPROM, 32 I / O lines that can be used to connect external devices (LCD, keyboard, speaker, card reader, etc.). Due to its small size, the EM1202 module can be used as a network interface in automation, security and data acquisition systems. The EM1202 also supports a Wi-Fi interface (the GA1000 module is also required). 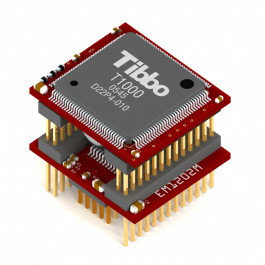 Based on a high-performance 88MHz ASIC (T1000) controller. 10 / 100BaseT auto-MDIX Ethernet port (without transformer isolation). Optional - Wi-Fi interface (requires a GA1000 expansion board). Encryption and debugging of Wiegand and clock / data streams. Up to 1024KB flash-memory for firmware, applications and data. 2KB EEPROM for data storage. Support for external LCD-panel and keyboard. Programmable sound generator for external speaker. Up to 32 general-purpose I / O lines (including 8 interrupt lines). 4 lines for monitoring the status of LEDs. Power supply: 230mA @ 3.3V (100BaseT mode, PLL on). The firmware is updated via the serial port (RS232) or ethernet.